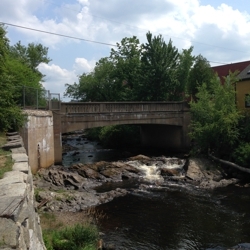 The current String Bridges were constructed in 1935 over the lower falls where the Exeter River meets the Squamscott River and are located in the Exeter Waterfront Commercial National Register Historic District. The roadway carried by the bridges is currently identified as String Bridge, however, it was previously known as Chestnut Hill Avenue. String Bridge is often referred to as a single bridge, however, there are two distinct bridges at the site separated by Kimball Island. The bridges are very similar and consist of cast-in-place reinforced concrete rigid frames founded on ledge with a 50’ clear span. The project includes a full evaluation of each bridge with a goal of rehabilitating them for long-term use. The project is being completed through the New Hampshire Municipal Bridge Aid Program with construction programmed for 2016. The Hoyle, Tanner team is excited to work with the Town of Exeter on the rehabilitation of these historic rigid frame bridges.